Ahh, the video game industry, where people come up with names by smashing random words together. Today's entry: Dawngate. 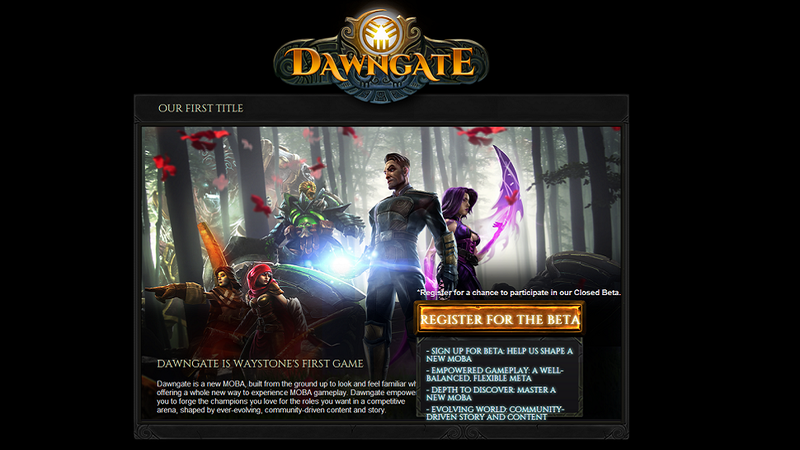 It looks like EA didn't mean to announce Dawngate just yet, as they haven't, well, announced it, but Kotaku columnist Superannuation discovered that the Dawngate website is up and running nonetheless. Dawngate is a MOBA—that is to say, an online battling game like Dota or League of Legends—"built from the ground up to look and feel familiar while offering a whole new way to experience MOBA gameplay." Remember, you're not really cool unless you have your very own MOBA. We've pinged EA to ask a bit more about the accidentally-announced Dawngate, and we'll let you know if we hear back.